Business Dictionary defines CSR (Corporate social responsibility)as "A company’s sense of responsibility towards the community and environment (both ecological and social) in which it operates. Every year, Red Tag Day is celebrated at 2nd October on Gandhi jayanti with the objective of practicing and preaching complete cleanliness. 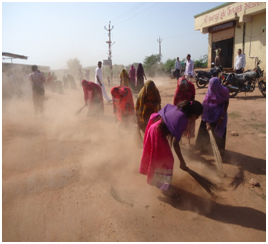 All cooperative owned society buildings observe complete cleanliness. In the year 2015-16, all the milk cooperatives participated in this scheme . It is planned to be held in the next year as well. Our country is still a developing country and economic status of our country is very bad because it is a male dominated country. Men (means half power of the country) are walking alone and they forced women to do only household works. They do not know that women are the half power of this country and combining to male can form full power of the country. The day when full power of the country would start working, no other country would be more powerful than the India. Men are not know how powerful Indian women are. In Indian culture, especially in rural areas, women remain indoors. They get fewer opportunities to interact with out side societies, expose themselves with new environment and know the day to day progress. In view of all this, Ministry of Human Resource Development, Department of Women & Child Development formulated programmes to involve rural women in dairy development activities as an approach of women development. In majority of the villages, cows & buffaloes are looked after by the house wives/ladies. Development of rural women through dairying was considered to be one of the means of women development because of their active participation in Dairy Development activities. It has been found that ladies are more particular in the management, feeding, breeding and disease control i.e. de-worming, and vaccination of animals for economic milk production. Ladies are more serious in caring for the animals especially new born calves. Involvement of rural women/specially house wives' contribution in clean milk production is incomparable. Scholarship for the education of farmers' son or daughter who are promising and good in studies. Scholarship is provided under " Bima Yojana" insurance schemes that operate jointly through LIC and Central Government support.